Artist's interpretation of the Temple of Artemis (Diana) at Ephesus. This illustration was created by Ferdinand Knab (1834-1902) around 1886. It is from Knab's series "Seven Wonders of the Ancient World." Online via Wikimedia Commons. Our story takes place when Turkey was inhabited by Greeks (and was known as “Asia Minor”). 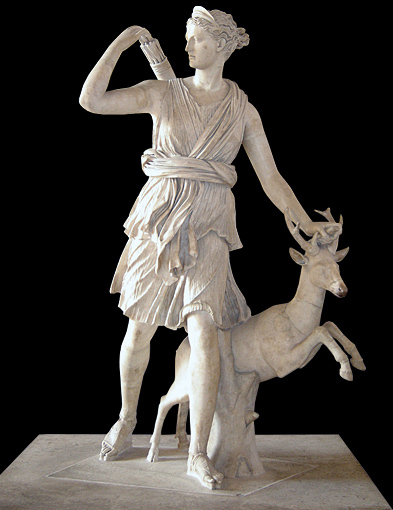 The Greek goddess of the Moon and hunting was Artemis (as depicted in this Roman copy of a 4th-century B.C. sculpture). The Greeks living in Ephesus—then a port on the Mediterranean Sea—built an enormous temple for Artemis in Ephesus. That temple was not the first to exist at the site, however. Its first version was created around 800 BC, and that first temple wasn’t dedicated to the Greek version of Artemis. It was dedicated to the Ephesian version (who was goddess of fertility). Over the many ensuing years, the original temple fell into disrepair and had to be rebuilt. After a war, it was completely destroyed. When it was rebuilt, as a temple dedicated to the Greek Artemis, an arsonist burned it to the ground—in 356 BC—just so he could become famous. I have seen the walls and Hanging Gardens of ancient Babylon, the statue of Olympian Zeus, the Colossus of Rhodes, the mighty work of the high Pyramids and the tomb of Mausolus. But when I saw the temple at Ephesus rising to the clouds, all these other wonders were put in the shade. (See Antipater of Sidon, Greek Anthology IX.58). It was a huge place. Around 425 feet (129 meters) long, it became the largest of the temples that had occupied roughly the same site for so many centuries. The temple, which Antipater so highly praised, doesn’t exist anymore because invading Goths massively damaged it around 268 AD. It had already been in decline, though, after Christianity replaced the worship of Greek gods during, and after, the first century AD. By the 12th century AD, people living in the town of Ayasalouk—once called Ephesus—didn’t even realize that the place had been the site of a wonder of the ancient world. Now it was just a muddy village about three miles from the coastline. No boats lined the harbor because there wasn’t a harbor. The place wasn’t bustling because it was no longer a major city. "Sir, is this the city of Ephesus?" "It was called that once. Now it is named Ayasalouk." "Well, where is your bay? Where are the trading ships? And where is the magnificent Greek temple that we have heard about?" Now the local is confused. "Temple? What temple, Sir? We have no temple here..."
Over the centuries, as Ephesus changed, its once-grand appearance had slipped away and its status, as one of the most-important cities in Asia Minor, had totally eroded. It was not always thus. Historians believe that the Temple of Artemis, at Ephesus, was the first building to be completely constructed of marble. No future arsonist would be able to torch its roof (like the incident which destroyed the prior temple in 356 BC). It housed many statues (including four bronze depictions of Amazons). The new Temple of Artemis was even larger than the Parthenon (which still stands in Athens). The Parthenon, dedicated to the Greek goddess Athena, had 58 columns while the Ephesian temple had 127. According to Pliny, the Roman historian, the Temple of Artemis was 425 feet long and 225 feet wide. The Parthenon is 230 feet long and 100 feet wide. Historians differ on how long it took to build this magnificent wonder. Pliny says it took about 120 years, but not everyone agrees with that time frame. When Alexander the Great passed through Ephesus, in 333 BC, the future wonder-of-the-world was still under construction. Alexander offered to pay for its completion, but Ephesian officials didn’t like his terms. He wanted to be credited as its builder. One of the best sculptors of the 4th century BC was Scopas of Paros. He was the designer of the Artemis temple—whose construction began around 350 BC—that became so famous. Like other architects before him, Scopas had his share of troubles building such a huge structure on marshy ground. Perhaps that is why it took so long to finish. Things change, and change hit Ephesus especially hard. Where there had once been a bay, filled with ships, a silt-filled area assured that no ships would return to trade or deliver passengers. As nature changed the appearance of the place, residents left the swampy lowlands to live elsewhere. When a Roman emperor called Theodosius the Great made Christianity the state religion, the final version of Artemis’ temple at Ephesus—rebuilt, to some extent, after the Goths' assault on the structure—was closed in 391 AD. A mob completely destroyed it in 401, and its stones were recycled for other buildings. Rebuilding Ephesus around 100 years later, the Emperor Constantine didn’t include the ruined temple in his building plans. Constantine had become a Christian, too, and he wasn’t inclined to revive veneration of a Greek goddess. There’s also the Ephesian open-air theatre—in much-better shape—to visit. In this place—characterized by wonderful acoustics (where popular artists, like Elton John, have performed)—we can imagine hearing the voices of those long-ago Greeks shouting their praises to both their city and their goddess. An Artist's interpretation of the Temple of Artemis (Diana) at Ephesus. This illustration was created by Ferdinand Knab (1834-1902) around 1886. It is from Knab's series "Seven Wonders of the Ancient World." Online via Wikimedia Commons. Bos, Carole "Temple of Artemis - Its Beginning and End" AwesomeStories.com. Jun 13, 2017. Apr 20, 2019.